Eat, Sleep, Ride and Repeat. Doesn’t that just sound heavenly? When I close my eyes and imagine what I would be doing if I were able to break free of the confines of needing to work, I always come back to the same daydream. Riding. In my office, there is a Speed Triple motorcycle model that routinely does wheelies across my desk as I sit on conference calls. On my office wall is a motorcycle themed print. At home we have copious amounts of motorcycle magazines, books, maps. 90% of our friends are motorcycle people. My computer is littered with motorcycle photographs, links to websites, and bookmarks to places I want to ride to. Motorcycles touch every part of my life. In this, I know I’m not alone. This sounds like we’re getting a little warmer towards what I’m going through. 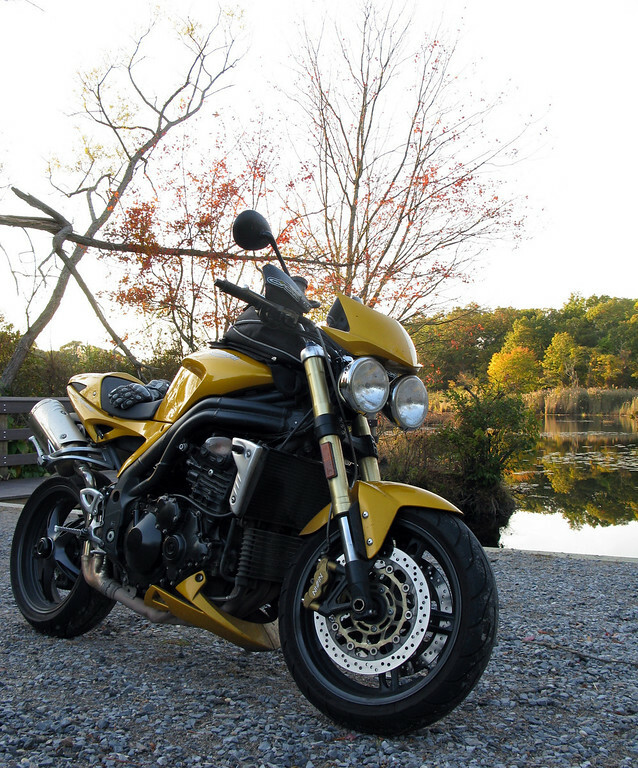 A typical way of life – Motorcycles at home, at work, at play? Check. A compulsive need for use? Bingo! Their draw is undeniable, inescapable, all encompassing. I surrender myself over to them. I am a motorcycle addict. So which is it for you? Hobby, Lifestyle or Addiction? I’m addicted to my hobby, which encourages my lifestyle. We all need to work to live and NOT live to work. Am I greedy by being all 3 Fuzzy? I think your answer is perfect, Biker Ted 🙂 Greedy? nahhhh… Probably most accurate. As with anything I do, first comes curiosity, and if it manages to hold my curiosity then eventually it turns into a hobby. If I’ve made past this stage it’s already turned into an addiction and I spent my waking hours feeding that addiction thereby inadvertently becoming a lifestyle. When I hear about motorcycles as a “Hobby”, I think of all the shiny motorcycles the are only ridden to bike nights and meet ups yet for some reason their owners have all the gear proclaiming exactly which brand of motorcycle they own and their garages are filled with cleaning products and huge bright banners that inevitably have the words “Corsa” in them. When I hear about motorcycles as a “Lifestyle”, I think of someone in a Aerostitch suit with all their life’s belongings packed onto their BMW. Complete with a 5 gallon jerry can and a set of tires. The “road” is their home because they’ve somehow managed to avoid paying for rent or a mortgage, managed to avoid personal commitments, and somehow have amassed enough $$$ to not have to worry about it. When I think of addictions and motorcycles, I think of the teenager drooling over all the shiny parts at their local dealer. You’ll often see them at the local B&N pouring over the latest motorcycle magazines or in parking lots running to check out the bike/s that are parked. Your description of “lifestyle” is how I imagine my retirement as I sit in traffic on the Expressway. It sounds beautiful and like each day would deliver you to something meaningful. An addiction in the sense that if I had to sell off my belongings to survive, Pearl would be the absolute last cherished thing I would part with. But it’s more than a lifestyle – it’s more like life itself – this is me – I’m a motorcyclist. It brings me joy and friends and community. It’s a way to express myself, my independence – even a way to give back to society. I cannot imagine a life apart from Pearl. i was going to comment on this, but you, Fuzzygalore, took the words right out of my mouth. It is so hard for me to imagine my life without motorcycles. I typed a much longer and intricate response but this really sums it up. They simply a part of my daily existence as few other things really are. I am sitting in an airport, about to head out from a week’s worth of meetings and I’ve managed, yet again to thread two wheels into the occasion. Head home from the west coast? Feck no. Catch a flight from Seattle to San Fran, rent a bike, ride Cali for 6 days then fly home? That’s more like it. More riding please….six days on the bike just serves to make the addiction worse, I think. Is there ever enough? It’s crazy to want to wander the world on two wheels, right???? Spot on assessment of our hobby/addiction. I did a similar blog post about the motorbike lifestyle and came to about 5e same conclusion.